NOTICE as of 10/04/2012: These BKGRND files must be corrected again. A fix is in the works to replace them within about one week. For the CIAO 4.4.1 / CalDB 4.5.2 release notes see How CalDB 4.5.2 Affects Your Analysis. 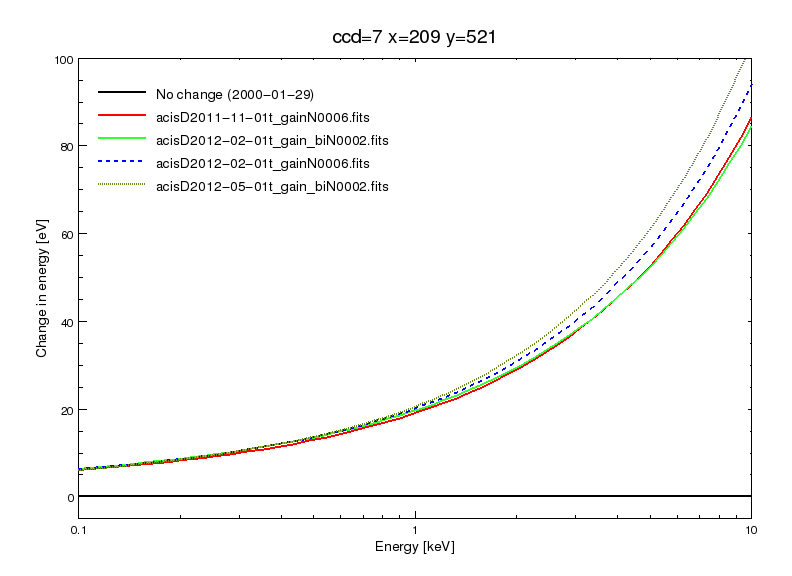 The periodic ACIS T_GAIN correction upgrade for May - Jul 2012 has been released. The corrections are at nominal/expected levels of less than 2% of the energy value. This upgrade as usual affects observation data taken over Epoch 50 and 49, and so would update PHAs for OBS_IDs taken since 01 February 2012. Users with such datasets are encouraged to revalidate their analysis results after reprocessing their data with the upgraded CalDB files. For specific details of the new calibrations in this release, see the technical details section below. DS and CIAO level 1 (re)processing tool acis_process_events. Also: CIAO reprocessing script chandra_repro for ACIS data with DATE-OBS after (UTC) 2012-02-01T00:00:00. Please Note: As of 10/04/2012 we have been informed that the above ACIS BKGRND files version N0002 have yet another problem resulting from their being rebuilt. The error causes the files to be useless and also causes acis_bkgrnd_lookup to fail. I apologize for the inconvenience! We are working to replace the files within about one week. We have found that the ACIS "Group E" blank-sky BKGRND files (those that become effective on 2005-09-01T00:00:00) have an error in their headers that produces a bad coordinate transform column "pha_COORD" in dmcopy and reproject_events, which in turn causes scripts such as specextract to fail. For further information, see the technical details section below. See the ACIS Background Memos web page for more details. 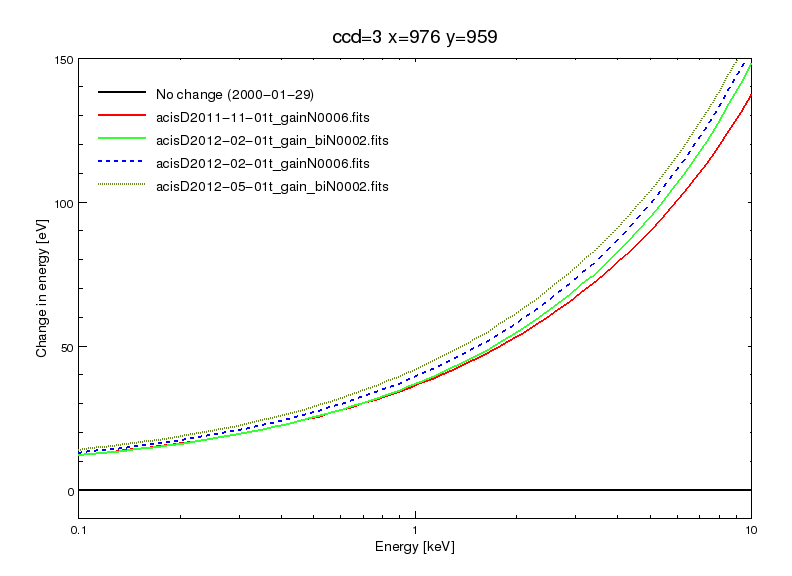 The ACIS time-dependent gain corrections (T_GAIN) have recently been updated for current changes from the previous T_GAIN epoch, specifically Epoch 50, which was May through July 2012. 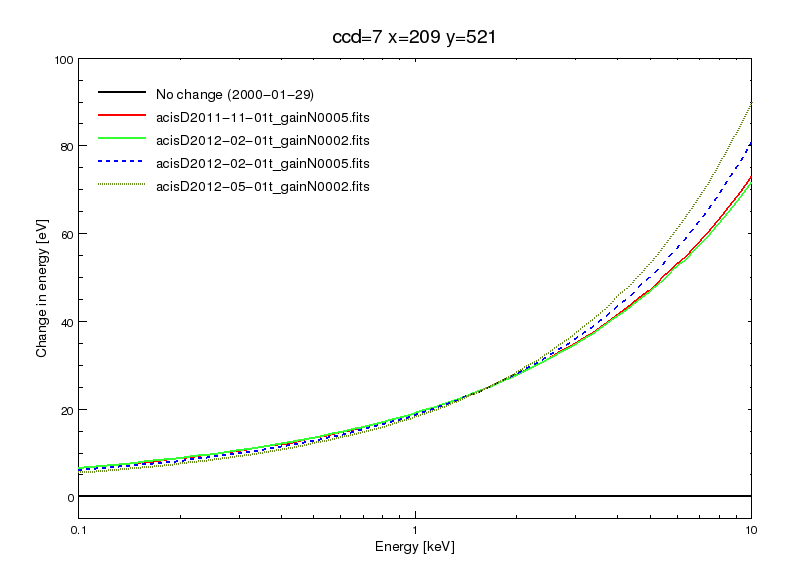 With the addition of these new corrections, derived from ACIS External Cal Source (ECS) data taken during radiation zone passes, the CalDB files extending from Feb 01 2012 through May 2012 (i.e. Epoch 49) have been finalized, and new non-interpolating T_GAIN files are now implemented for Epoch 50. The lastest set of ACIS Blank-sky Background files, labeled collectively as "GROUP E", which also have effective date 2005-09-01, have been found to have two errant structural keywords in their headers. Specifically the header keys "LATP9" and "EQUI9" are present, which causes an inappropriate coordinate transform column to appear in those files. Other BKGRND files don't have these keywords. Users have found that the script specextract fails when these GROUP E BKGRND files are used in the blank-sky background file thread, to reproject the events there-in and allow background level estimates for extended source analyses. We have corrected this problem by rebuilding these BKGRND files with the above two keywords removed from the headers. All 18 of the files have been corrected this way, and their version numbers have been upgraded to N0002, so that they will not be confused with the errant files.